Man your on fire! Great work Alex. Looking forward to giving these a build. Roll on the weekend! 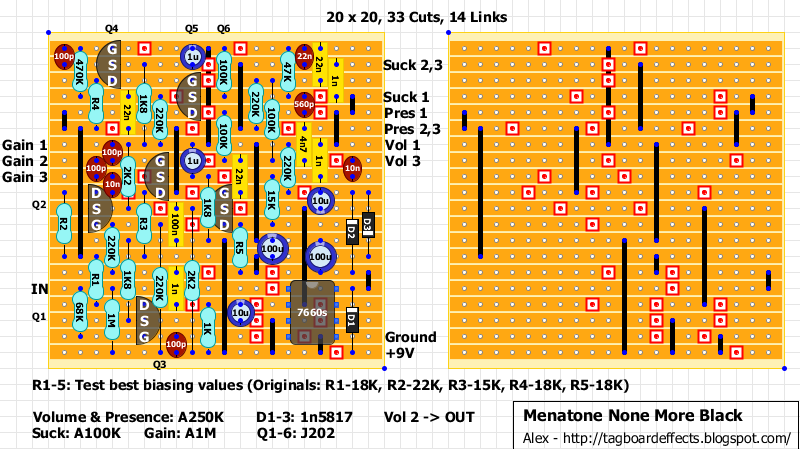 I didn't mention you or jok3rx because the schematic was't created on this blog. I've added a link to the original FSB thread where people can find all info. The "obviously stated" charge pump wasn't in the schematic. I've added it because I didn't know if it was meant to be there or run on an 18V power supply. Ok stupid question but why are there 2 layouts? It's written in the introduction. One has trimmers and one has fixed resistors to bias JFets. Sometimes trimmers can create noise. Veerified the version with trimmers but had to use 2N5457s as i have no J202's, but they are on order. It sounds quite bright but that may be the 5457s. Also there is a bit of hiss n crackle in the background, but it is a high gain pedal, possibly from the trimmers. Other than that sounds pretty good. Cheers Alex. That's why I've posted 2 layouts. I think the sound could be the 2n5457. I also built the version with trimmers. I used j201s and it sounds pretty damn good. I also get a lot of background noise, but I might box this one and hope that helps, my test setup has too many free and crossing wires. I may even take readings from the trimmers later and build the other version. No need to build the other version. You can always remove the trimmers and add the resistors instead. You could put them in diagonal or use 1/8W resistors if you don't want them standing. Oh... duh... totally didnt even think of that. Thanks Alex. J202s arrived today so slotted them in and just like that it became a totally different beast. Had to re bias the trimmers. Sounds really good now and background noise is minimal. Cool! Gavin where did you get you j202s from? Hello Guys, is there's much difference between J201 and J202? Thanks for your help. Real nice job Alex, I've made with 2SK30 and it works but I think a little high distorted and also have some noise and crackle. I made it in bread-board, may be should put in a box.I think the bias should adjusted, could you tell me how to adjust POT, or give Vgs of Fets. Thank you in advance. Maybe a dull question, but i'm pretty new to this stuff. what's the purpose of the trimmers? or more importantly, what will be the main difference between the finished product of the two layouts? I'd like to build this and i have everything but the trim pots, should i just build the first layout, or is it worth waiting til i source the trimpots? No offense, the nature of your question suggests that this build may be over your head. If it was me I would wait tell u get the trimmers. 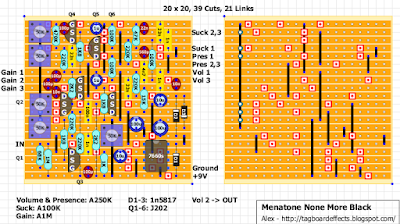 If u build the first layout u may have problems biasing the transistors if you don't know how to do it. 50k trimmers are easy to find. Only thing I can think of between the to finished layouts is the trimmers might add just a little more noise to the cirquit. But I don't think u will here anything. Gudday, just built this with the J202s and trimmers. Sounds great, but the noise make it pretty unusable. I'd like to think it might go away in the process of boxing it but does anyone have any ideas? 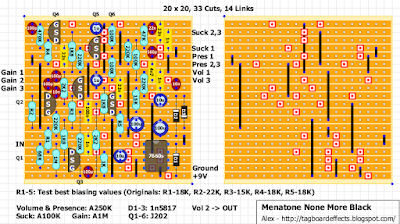 Should I attempt to go with trimming resistors, and can the trimming resistors replace the trimpots in the trimpot layout? I've never been lucky enough to have boxing get rid of any noise. The main thing is gonna be biasing, particularly for the early stages where any noise they produce is further amplified by subsequent stages. Everything I have built with multiple J201 or J202 was really sensitive to drain resistors. I would do like Travis said and try trimmers on the drains and adjust it by ear. I've built the version with trimmers - I was asking about changing to the bias resistors as someone mentioned above trimmers can be noisy. What are we looking for when biasing by ear? Mine are all biased around 9v, within .05v or so. I have plenty of j201 currently too. Might try those in it. Also have some 2sk30. Update: I removed the chargepump (linking pins 1-2 on the socket) and put a klon buffer in front. Much better. 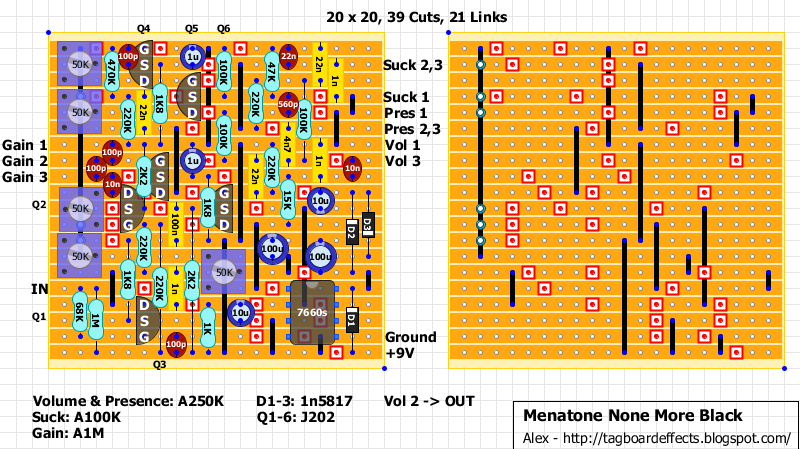 There is 32 cut in thé first layout no?